In the current study, the benthic macroinvertebrate fauna of Karagöl Lake was investigated. Sampling was carried out seasonaly in 2012 and 2013 and a total of 4 samplings were done. As a result of the study 4 Oligochaeta and 13 Insecta taxa were identified and all are new records for the lake. Bu çalışmada, Karagöl (Denizköy-Dikili-İzmir)’ün bentik makroomurgasız faunası incelenmiştir. Örneklemeler 2012-2013 yıllarında 4 mevsim yapılmıştır. Karagöl’deki araştırma sonuçlarına göre 4 Oligochaeta ve 13 Insecta taksonu tespit edilmiştir. Tespit edilen tüm taksonlar Karagöl için ilk kez kaydedilmiştir. Balvay, G., 1977. Determination des larves de Chaoborus (Diptera, Chaoboridae)., Rencontrees en France. Annales d'Hydrobiologie, 8(1):27-32. Brinkhurst, R.O., Jamieson, B.G.M., 1971. Aquatic Oligochaeta of the world. Univ. Toronto Press, 860 p., Toronto, Canada. Geldiay, R., Tareen, I.U., 1972. Bottom fauna of Karagöl lake. 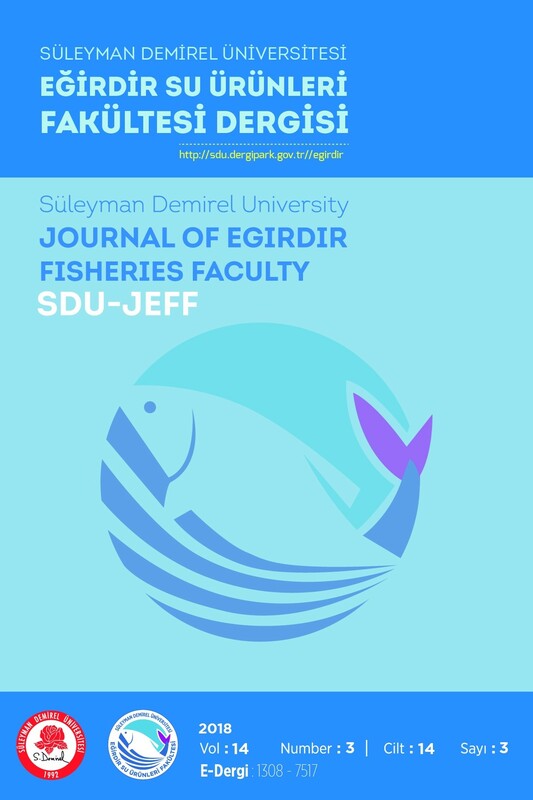 Scientific reports of the Faculty of Science, Ege University, No:137, 15 pp. Hansen, M., 1987. The Hydrophiloidea (Coleoptera) of Fennoscandia and Denmark. Fauna Entomologica Scandinavia Volume 18, E.J. Brill/Scandinavian Science Press Ltd., Leiden-Copenhagen, 254 s.
Jäch, M.A., 1991. Revision of the palearctic species of the genus Ochthebius Leach VI. the marinus group (Hydraenidae: Coleoptera), Entomologica Basiliensia, 14:101-145. Jansson, A., 1986. The Corixidae (Heteroptera) of Europe and some adjacent regions, Acta Entomologica Fennica, 47:1-94. Johannsen, O.A., 1937. Aquatic Diptera Part lV. (Chrinomodiae), Subfamily Chironominae. Mem. Cornell. Univ. Agric. Exp. Stn., 210 pp. Karacık, Z., Yılmaz, Y., Pearce, J. A., 2007. The Dikili-Çandarlı volcanics, Western Turkey: Magmatic interactions as recorded by petrographic and geochemical features. Turkish Journal of Earth Sciences, 16:493-522. Kasprzak, K., 1984. The oligochaetes (Annelida, Oligochaeta) in a lake and a canal in the agricultural landscape of Poland, in: Bonomi, G. et al. (Ed.) (1984).Aquatic Oligochaeta: Proceedings of the 2nd International Symposium on Aquatic Oligochaete Biology, held in Pallanza, Italy, September 21-24, 1982. Developments in Hydrobiology, 24:171-174. Klink, A.G., Moller Pillot, H.K.M., 2003. Chironomidae larvae. Key to the Higher Taxa and Species of the Lowlands of Northwestern Europe. World Biodiversity Database, CD-ROM Series. Expert Center for Taxonomic Identification, University of Amsterdam. Nilsson, A.N., Holmen, M., 1995. The aquatic Adephaga (Coleoptera) of Fennoscandia and Denmark. II Dytiscidae. Fauna Ent. Scand. Vol: 32. E.J. Brill, Leiden, 188 p.
Saether, O. A., 1972. Das Zooplankton der Binnengewasser. I., Teil VI., Chaoboridae. Die Binnengewasser, Band XXVI: 257-280.Savage, A.A., 1989. Adults of the British Aquatic Hemiptera Heteroptera. A key with ecological notes. Freshwater Biological Association, Ambleside, Scientific Publication No. 50. 173 pp. Şahin, Y., 1984. Description and distribition of Chironomidae larvae in the streams and lakes of Estern and Soutestern Anatolion. Anadolu Üniv. Yay. No:57, Fen-Ed. Fak. Yay. No:2, Eskişehir, 145 s (in Turkish). Şahin, Y., 1991. Chironomidae Potamofauna of Turkey. Tübitak, TBAG-869 nolu proje, 88 s (in turkish). Timm, T., 1970. On the fauna of the Estonian Oligochaeta. Pedobiologia, 10:52-78. Timm, T., 1999. A Guide to the Estonian Annelida. Naturalist’s Handbooks 1, Estonian Academy Publishers, Tartu- Tallinn, 208 pp. Timm, T., Veldhuijzen van Zanten, H.H., 2002. Freshwater Oligochaeta of North-West Europe. World Biodiversity Database, CD-ROM Series. Expert Center for Taxonomic Identification, University of Amsterdam. Jäch, M.A., Beutel, R.G., Delgado, J.A. & Diaz, J.A. (2005). 11.1. Hydraenidae Mulsant, 1844. In Handbook of Zoology, Volume IV Arthropoda: Insecta Part 38, Coleoptera Beetles, Volume 1. Morphology and Systematics (Archostemata, Adephaga, Myxophaga, Polyphaga partim). (Eds. Beutel, R.G. and RAB Leschen) 224-251 pp. W. DeGruyter, Berlin. Rosenberg, D.M., & Resh, V.H. (1993). Freshwater Biomonitoring and Macroinvertebrates. Chapman & Hall. 488 pp, New York. Savage, A.A. (1989). Adults of the British Aquatic Hemiptera Heteroptera. A key with ecological notes. Freshwater Biological Association, Ambleside, Scientific Publication No. 50. 173 pp.